Today was a lovely day here in Alabama. The temperature got to at least 74 degrees F. So it was wonderful to go out in a thin polo type shirt. I had gotten a card in the mail from a local fabric shop. The Saturday "percent off" was a lovely 50%. (Thurday was 33% and Friday was 40% but I couldn't go either of those days) Oh my. And here I am thinking "I said I wouldn't buy any fabric until I make something out of what I have." Well ladies and gents, that idea went on "hold and ignore" for the day. 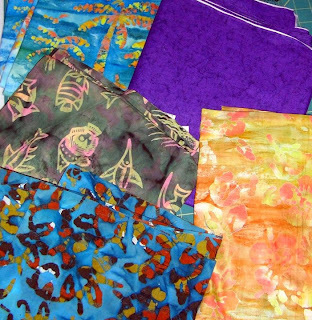 I do love some batik and batik style fabric. So I picked out four of those. I also saw this delightful rich purple fabric that called out to me and said "You know you have to have me." What could I do? A zombie-like look crossed my face and I said "yes, must have the pretty purple fabric, I must ...I must!" Thank goodness I was in a hurry..or well, it would have been pretty until the credit card bill came! That bill wouldn't have been so pretty. One yard of each of the other three. I also got six spools of quilting thread. All this fabric and thread for less than twenty bucks, US. WOW....great bargain to get all that and still get change back from a twenty!!! Very nice fabrics, by the way. I am not a quilter but I absolutely love quilts! I have several that are prized possessions, at least to me. You've got some great fabric. My favorites are the purple and the palms. 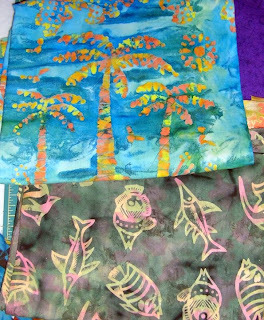 So envious of your buys, and at such a good price, fabric is very expensive here in the UK alot of the batiks are £9 a metre, just love the purple and the palm trees, are these just to look at and stroke or are they for a particular something ? Lovely fabrics! The fish one is sooo cool! You sound like me......LOL.....BTW.....pretty wonderful fabric choices.